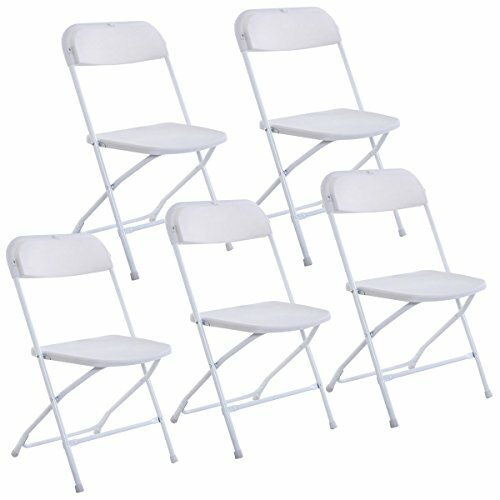 This Is Our Brand New 5 Pcs Plastic Folding Chairs Which Is Lightweight And Suitable For Many Occasions Such As Parties And Events. Featuring High Quality Plastic Body And Steel Frame, These Chairs Will Assure You Comfortability And Reliability. And It Can Be Folded And Locked In Upright Position Manually So It Is Easy For You To Save Space And Clean. Don't Hesitate To Buy It Now! • Diameter Of Steel Tube: 0.75";Thickness Of Steel Tube: 0.05"
• Nice Design: Our 5 Pcs Plastic Folding Chairs Which Is Lightweight And Suitable For Many Occasions Such As Parties And Events. • Sturdy Material: Plastic Body And Steel Frame, These Chairs Will Assure You Comfortability And Reliability. Material: PP, Steel Tube. • Weight Capacity: 330Lbs-440Lbs ,And It Can Be Folded And Locked In Upright Position Manually So It Is Easy For You To Save Space And Clean. • Size:18"X18"X31"(L W H), Diameter Of Steel Tube: 0.75";Thickness Of Steel Tube: 0.05", No Assembly is Required .